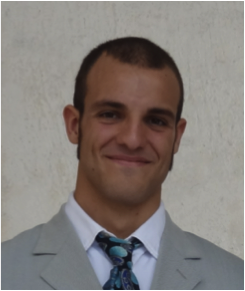 We are happy to announce that Nicola Luminari from Italy has won the SoHPC14 Best Student Prize! Nicola was on placement through the programme in the Czech Republic at IT4Innovations(VSB-Technical University of Ostrava), under the supervision of his project mentor Tomas Karasek Ph.D. Nicola and a fellow SoHPC student Martin Weber from Austria worked on the same project with the objective to develop a car racing game, which can demonstrate the capabilities and application of HPC systems. This game will be used to promote HPC among young people. In the game players have the freedom to modify the design of the car (size, shape, etc. ), which impacts its chance to win the race. Through this game the basics of fluid dynamics (i.e. aerodynamics) and the effect of drag coefficient on car performance (car speed) is demonstrated. – Sensitivity analysis to obtain mesh independent drag coefficient. – Scalability tests for mesh obtained from the previous step to establish optimal number of cores to be used in the game. It was very impressive how quickly he was able to learn new skills and how he solved problems, which emerged during the development of the game. His very pro-active attitude allowed us not only to finish this game on time but we were also able to include more features than originally expected. It is only thanks to the team’s very hard work and devotion to this project that we have very nice looking game which is not only be entertaining but will also educate the younger generation. Without Nicola there wouldn’t be any physics behind this game and thus the game would lose much of its educational value. Thanks to all participants for your hard work on projects of SoHPC 2014!